So let’s start with a correction – this lovely, traditional Austrian Gasthof is not located in St. Anton 🙂 but rather in neighbouring St. Jakob. However it would be a little confusing for people looking for accommodation for their ski trip starting in the well-known St. Anton, so let’s stick to the misrepresentation and call it St. Anton. The truth is that those small villages, including the further-down-the-road Pettneu, is very closely connected and the logistics to and from the ski lifts are smooth when using the free shuttle bus services that runs every 15 minutes during peak hours – and it is not just one crowded bus, but often you will see two or three in a row to make sure there is room for everyone and all their gear. The disadvantage is that you can’t crash heavily drunk out of an after-ski bar in St. Anton, walk 2 min and hop in to your bed. However, the advantage is exactly the same – that you won’t have drunk people wandering around in St. Jakob singing and shouting 🙂 This is really a nice, quiet place blessed with magnificent mountain views. 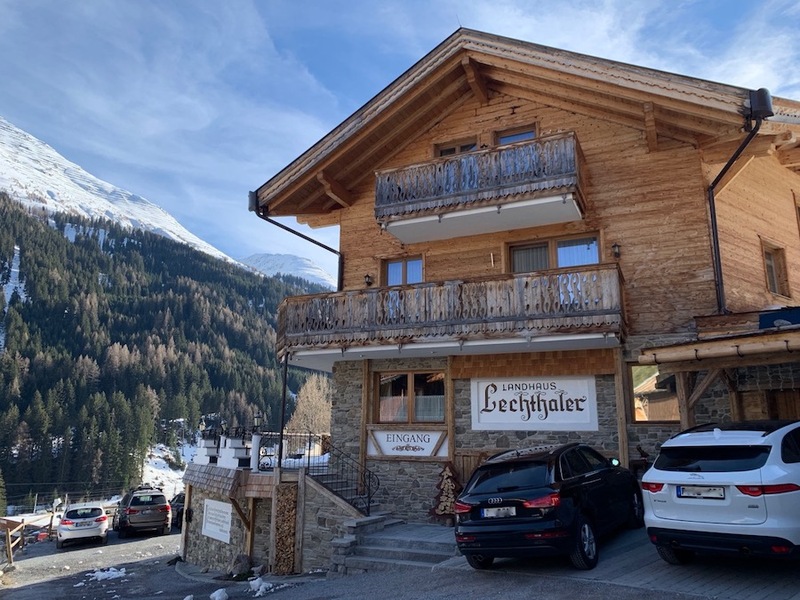 And Landhaus Lechthaler offers exactly this – just look at this balcony scenery – who would not want to sit there in the afternoon enjoying the last sun and recovering your sore legs after a long day on the slopes? So if you can overcome the short 5 min bus ride to nearby gondola Nasserein, and if the quietness and scenery of St. Jakob is tempting, this little place is worth considering for your next stay. It’s traditional, but with some nicely renovated rooms and – one offering your own two-person infrared cabin, a charming four poster bed and spacious relax areas. Nice! The staff is friendly, the restaurant traditional Austrian (read: a little boring and most meat are fried – don’t know why they do that?) but hey – when you get up in the morning there is an overly delicious breakfast buffet! That was really outstanding! Overall the Landhaus Lechthaler is definitely worth a stay and would be a recommended WhereToGoSkiing accommodation. Read our overall review of St. Anton here. Previous story What it’s Like to Stay in a Luxury Ski Chalet?